We’ve all done our fair share of shopping at retail stores, but you never really stop to think about how much work goes into merchandising until you’re called upon to do it with your own stuff—and in your own garage! Now that you’ve read that sage advice (seriously, go read it! ), I’m going to expand on a few points. Just to note, when you see text in double quotes (“like this”) it’s quoted from one of the two above articles. “Same applies to your garage, house and front yard too. People will judge your sale by first impressions. Should they bother stopping or should they continue to the next garage sale on their list? Make sure your customers are presented with a welcoming and organized entrance from the street. Long, narrow tables are best, so people don’t have to lean too far over to reach items. If you’re doing the sawhorses/plywood trick, don’t put anything super heavy on top—plywood can’t withstand much weight in this manner. I had great luck borrowing tables by posting on Facebook and on our neighborhood NextDoor site. Lots of friendly folks were willing to loan me tables if I promised to pick them up and drop them off. Other friends borrowed from their church. Use your resources! The U-shape, around the outer walls of your garage, will allow shoppers to walk around and people to push strollers through. If your garage is large enough, you can put a table or two in the middle, but try to keep at least two people-widths of space between the outer U and anything in the middle. If your garage is small, position tables on two walls to form an L-shape. This will still give with enough room for people to walk past others shoppers. Adult and big kid clothes do best on racks, arranged by size. They look nicer, are easier to browse through, and less likely to end up on the floor. If you don’t have hanging racks (and can’t borrow from friends), improvise. Rope stretched between two anchor points isn’t actually the best plan; everything will sag toward the middle. A better bet: buy a length of cheap chain from TrueValue and spread it tightly between two points. Put the hangers through the links, and the clothes won’t slide. Sweet. Other ideas: a squeezey shower curtain rod between two unmovable objects, or a thick wooden dowel between two ladders. I know it’s called a “rummage sale” (in some locales), but nobody likes to dig through a bin. Clothes should be on tables or hung up to make it easier to browse. Plus, clothes that are hanging or tabled will have a perceived higher value compared to clothes than have been dumped in a box. The sunlight will make colors look drab and dull. If you have a random pair of kid shorts and a T-shirt that just happens to match perfectly, pin them together into a set. They’re more likely to sell. Same goes with adult clothing, and in fact, I think it’s a better plan with adult clothing! It’s easy to put together cute kid outfits, but adult clothes are a little trickier for most people (okay, maybe that’s just me?). Clothes should be located in the same general area of your sale, just as lawn & garden should have its own general area. Think through the amount of tables you’ll need to display all of your stuff. Some shoppers will let their kids run wild like banshees at your sale (although I personally can’t imagine a worse version of hell than garage sale-ing with a kid in tow, BLECH). They probably won’t be willing to pay for anything their kids break, either, so keep that in mind when you lay out your breakables. Put anything breakable at the BACK of your tables, farthest from tiny hands. 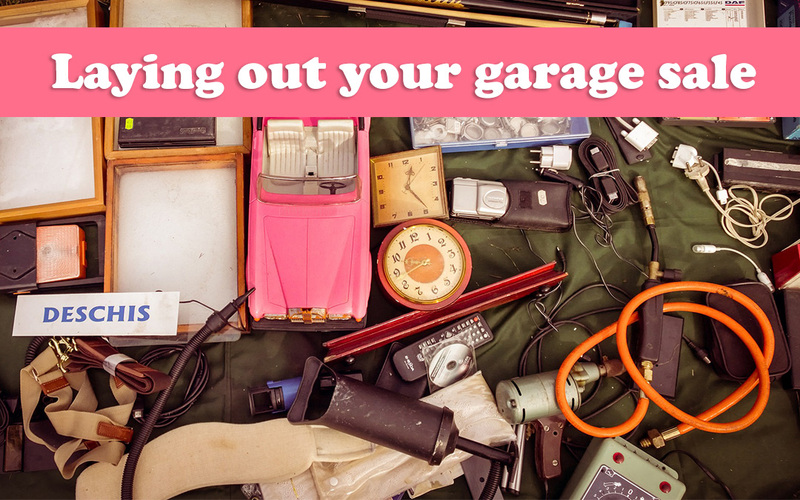 Don’t hide your showy items inside the dark depths of your garage; put that stuff out where people can see it. The good stuff will draw them in and get you more shopper traffic. Trinkets, small wall hangings, frames, vases, and the like do best on tables. Large wall art can go in bins on tables, hanging on the wall above the tables, or if you have the space, spread it out on a tabletop. Move non-sale items out of your garage, or mark them with “not for sale” signage. If they can’t be moved out of the garage, drape an old bedsheet over them to hide the not-for-sale items from view. Assume this: if it’s visible, people will try to buy it, so cover it up. Like I mentioned up above, there are a couple of great resources on this topic already on the web. See my two favorites here and here.